I wasn’t going to post this but changed my mind because it may help one of you who will face this surgery or maybe a family member. That was a post I wrote about surgery for a herniated disc in my neck. One week ago I received this comment from someone who is concerned for a friend. Hi Maxi, What happened with your surgery? My friend might have to do something like that and I am very worried about him. I gave my word that I would post the results of the surgery … actually, I’m late. When the surgeon spoke to my late husband and me before the surgery, he showed us the prototype with the plate and the one with the screws. As fate would have it, I am sooo fortunate. It was Wednesday, January 11, 2011 when I had the first surgery on C3. 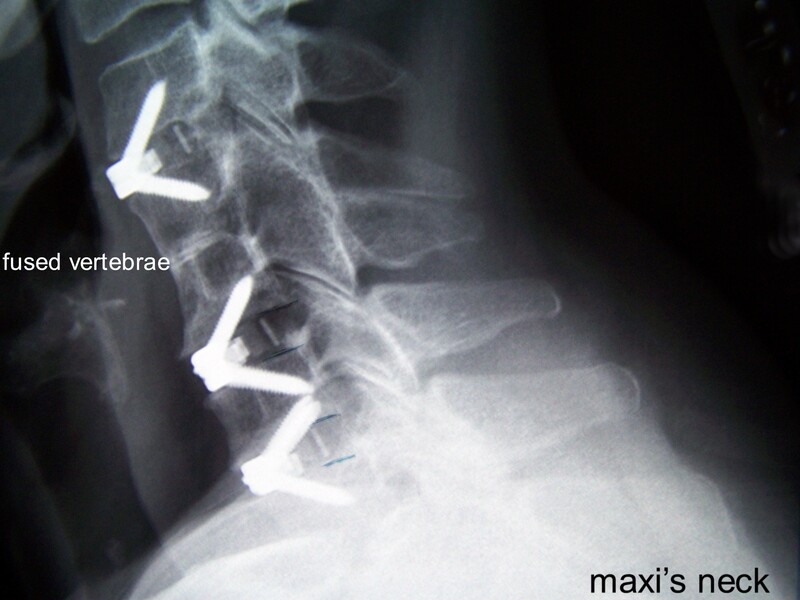 A titanium disc was inserted using long screws. The vertebrae in the middle of my neck were fused at birth, which is very rare, so there is no disc. The second surgery was done October 22, 2013 on C6 and C7. Again, the screws were used giving me more movement. This is a long surgery, at least four hours. I gotta tell ya, any major surgery is painful. Very painful. Still, it began to ease within three to four days. This entry was posted in Health and tagged Fate, Herniated Discs, Neurosurgeon, Prototype, Star Wars, Surgery, Vertebrae, X-ray. Bookmark the permalink.